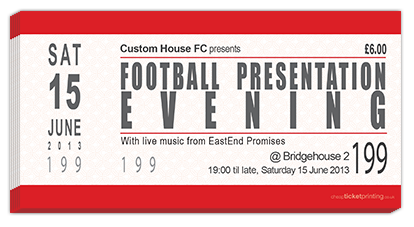 With the end of the football season approaching, we’re printing a lot of tickets for football teams annual presentation nights. Here’s a few examples. 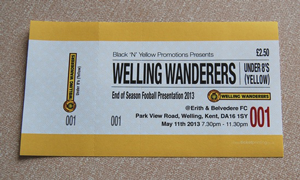 We'll be adding some more Football Presentation Ticket samples soon. I'll be sad to see the end of the football season, especially being a Manchester United fan - farewell Sir Alex. I hope it's been a good season for your football team. Order your football team tickets worth us today.